The quotes below are perfect to express true love and care for a significant other. The following words convey honest feelings that come straight from the heart. Make use of them in order to clearly communicate your burning passion for your lover. Each says “I love you” in an artful manner. Although it takes a mere minute to develop a crush, only an hour to like another and a full day to love another, it takes an entire life to forget that person. Greek mythology states that human beings were designed with 4 legs, 4 arms and a two-faced head. The Greek God, Zeus, divided humans into two distinct sections, making them spend entire lifetimes looking for their missing halves. Although it is easy for someone to say that they are in love with you, it is difficult to find someone who truly does. If loving you meant that I would run out of air, I would say that I love you in my dying breath. They say that love punishes but it is a lie. Being alone, rejected and losing a lover is what hurts. Love is the ultimate cure for any of these pains. There is no distance too far and no time too lengthy that will keep two true lovers apart. Love is found through the acknowledgment of a person’s imperfections, not their perfections. Love is a language that is expressed with many words but only understood through our hearts. No mountain is too high and no river is too wide for true love. Although the beginnings are frightening and conclusions can be tearful, what matters is what’s in the middle. It’s the journey that makes the trip worth taking. It was fate that we met, our choice to form a friendship but our love for one another was destiny. 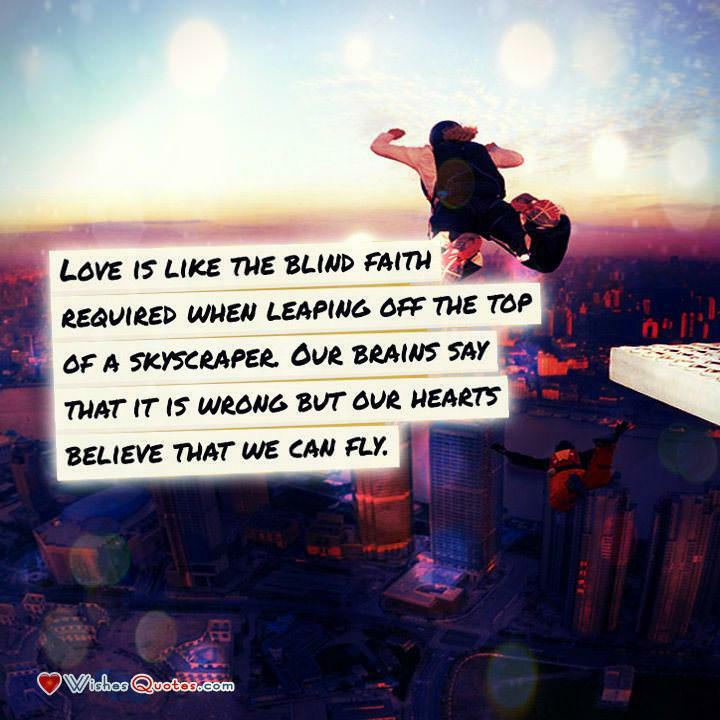 Love is like the blind faith required when leaping off the top of a skyscraper. Our brains say that it is wrong but our hearts believe that we can fly. Can love be defined? It is a natural reaction in chemistry, a war in history, a formula in math, a passionate heart in art and for me it is only you. You are truly in love with him, aren’t you? It is a straightforward inquiry, yet no one was identified and someone still jumped into your thoughts. You love someone for their idiosyncrasies, not their infallibility. You know your love is real when you’d prefer to stay awake because this life is better than that of your dreams. Love someone like they can’t hurt you. Live this life as if it is as good as it gets. Dance your heart away as if nobody can see you and sing like there is nobody listening. Love is all that is necessary. It is what we breath. What we live on. It is what will protect us. When you have it, you don’t need anything else. It’s not the character traits that we love. It’s the people. We love their faults as much as their strengths. The truth is that we’re all alone. We come into the world alone and we’ll leave alone. Yet love masks the loneliness and let’s us pretend that in this moment we are together as one. In your final moments you’ll review your life and understand that you really lived in the times that you acted out of love for others as well as yourself.